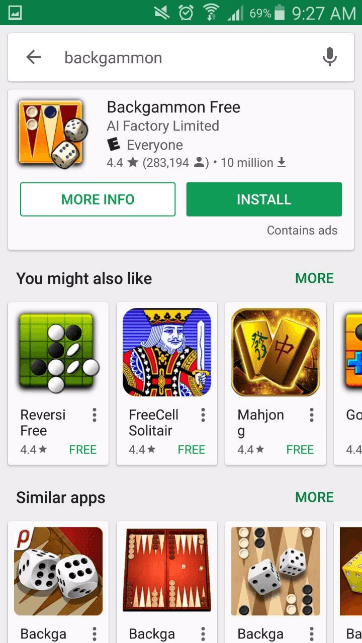 For several months now, Google Play has been experimenting with different search results layouts in the Google Play Store. In this blog post, we will discuss these changes’ effect on organic app installs. This article can be considered as a “true App Store Optimization analysis”, as it analyzes changes in the App Store, whereas our research usually focuses on changes in App Pages. Starting November 2016, Google has tried to simplify the app installation process through new search results layouts. Since then, a search for a specific brand name often results in an info cards type design, emphasizing the first search result and making it simpler to download an app straight from the search results, without having to go into the app page itself. 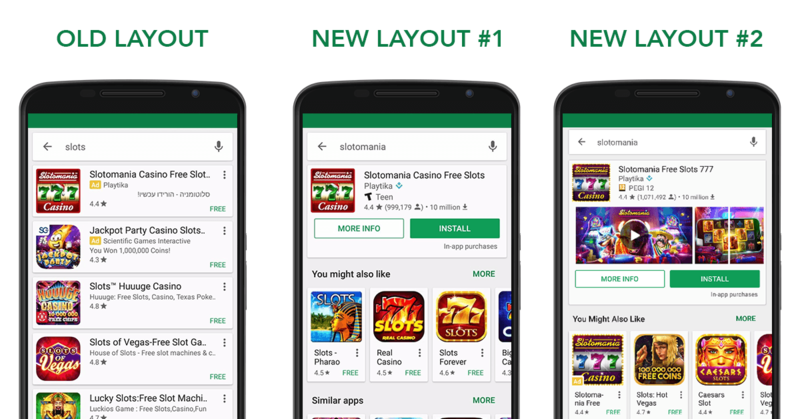 We have discussed this type of search results layout and its implications on ASO in December’s blog post, titled “Major Makeover Being Experimented for Google Play’s Search”. In the past week, Google Play released an even more captivating search results layout, which can be considered a more advanced version of New Layout #1. This new layout shows the app’s icon, title and the first several screenshots. If the app page has a preview video, Google Play will also present the feature graphic (as you can see in the image below). 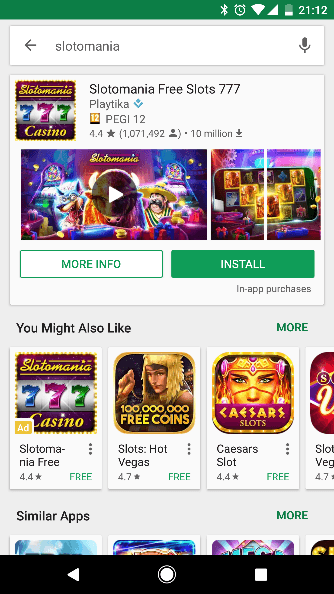 While this new layout deserves its own blog post, we were interested in seeing whether these new layouts are successful, meaning whether the new layouts improved users’ experience in the Google Play Store, as we assume Google intended. For this purpose, we defined two variants as indicators of success. Using data provided from the Google Play Developer Console’s User Acquisition section, we were able to calculate the aforementioned figures for 10 of our apps, and compared these numbers across the three different types of layouts in three different time periods. Calculations of the percentage of Non-Page View Installs and Overall CvR are presented in the table below. 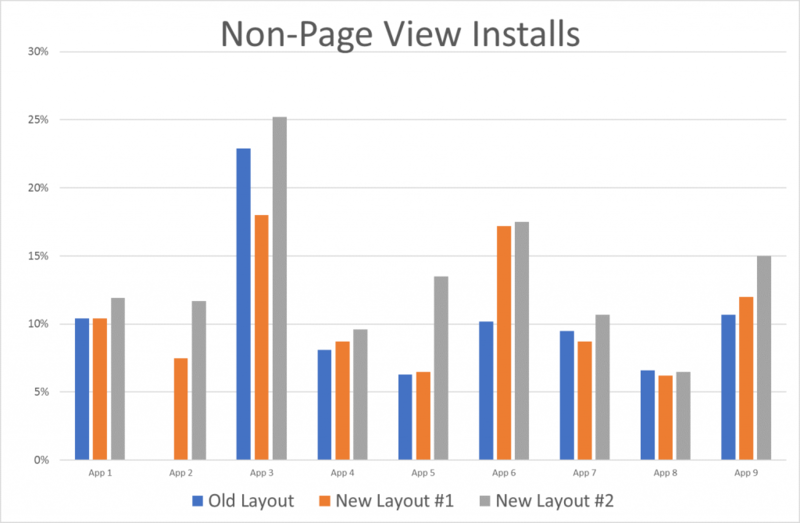 For this specific sample app, the percentage of Non-Page View Installs has steadily increased throughout the three time periods. This suggests that the new layouts are successful, in the sense that they do make users more inclined to install an app right from the search results. Obviously, this is only one app, which makes this analysis very hard to derive real conclusions from. 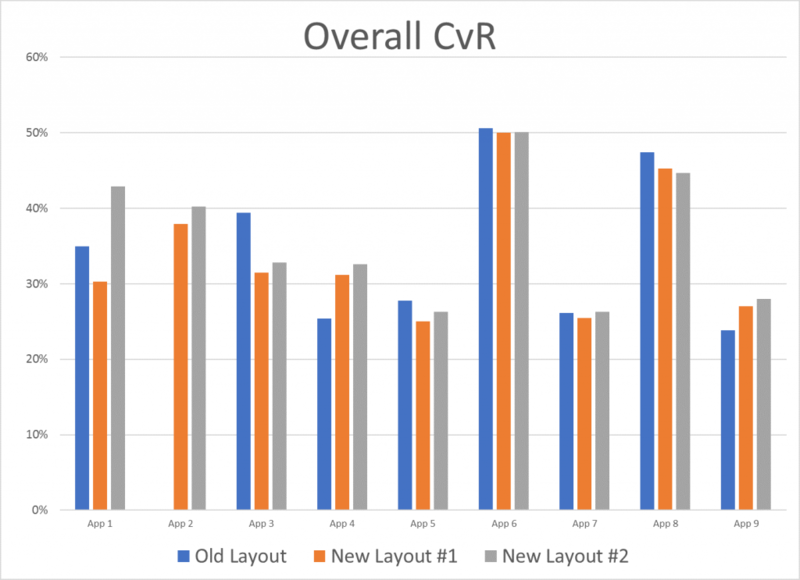 For this reason, we looked at 9 additional apps and pulled the same numbers.Looking at data for the metric we called “Overall CvR”, it seems like it increased from the Old Layout to New Layout #1, but decreased from New Layout #1 to New Layout #2. This suggests that, in this example, the new layout was not very successful in inducing more installs per page view. Looking at this data, it seems that, apart from App 8 which saw a very minor decrease, the percentage of Non-Page View Installs has increased across all other apps. This strengthens our finding from the first app we analyzed, that the new layout does make users more likely to install an app without looking at its app pages. It is also interesting to notice that this percentage did not significantly change from the Old Layout to New Layout #1. This suggests that Google’s previous layout was not successful enough in inducing this type of installs, which explains why Google chose to replace it with New Layout #2. Unlike the % of Non-Page View Installs, Overall CvR for these 9 apps did not significantly increase throughout the three different layouts. This suggests that the new layout is not very successful in enhancing conversion rates, or at least not as successful as it is in increasing the % of Non-Page View Installs. 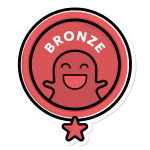 Obviously, we examined 10 apps out of several millions, and there are many external factors that might influence this metric, so we cannot state anything with full certainty. However, it seems like Google will still need to modify the Play Store design in order to encourage users to installs more apps. Much like us, humble online marketers who experiment with different assets of our app pages/websites/ads, Google is constantly testing new ways to improve its own products. It is comforting to see that even Google tries different designs, and that they too fail sometimes. Out of the above sample of 10 apps, we can see that the new App Store layouts did not necessarily induce a higher overall CvR. Moreover, it seems that Google’s first shot at displaying info cards in search results (New Layout #1) was not an entirely successful one, or at least not as successful as their second attempt (New Layout #2). We expect to see additional changes in the Google Play search results layout soon. We will be ready with Stata sheets and Excel tables pinned to our taskbar, anxious to analyze results.